A sign rejecting "thoughts and prayers" at March For Our Lives. The concept of posting thoughts and prayers on your Instagram story needs to end. When something like a mass shooting occurs, social media platforms flood with the usual sentiments: “Thoughts and prayers.” “My heart goes out to the victims.” It’s almost a competition as to who can post how sad they are first. After 48 hours, however, it’s as if the tragic event with mass casualties never even happened. America moves on. How terrifying is it to think that no one will ever feel moved to do something about an issue unless it happens to them? Must everyone in America lose a child or a brother or a friend in order to care for longer than 48 hours? To do something more than post on their Instagram account? Tree of Life, Parkland, Christchurch, and the countless others. The hate crimes, the brutal attacks, the lives taken without reason. The mothers and fathers of victims will never be able to move on. They will stand in the same position forever, analyzing and living through the death of their child over and over again while the world quickly moves on to the next “trend.” America leaves them forgotten. It is easy to forget. It is easy to get caught up in our individual struggles and lose track of our privilege. What Americans must remember is that privilege equals power. When the majority of people use their privilege to participate in a trending hashtag and forget about it two days later, they are neglecting the power they have to turn a statistic into a human being. An Instagram story lasts only 24-hours, but a wrongful death lasts forever. In essence, we have become desensitized. An Instagram story lasts only 24-hours, but a wrongful death lasts forever. Gun violence, for example, something so horrific and primal, becomes normalized to the point that it becomes a blip on the radar screen in the 48-hour news cycle. We have become so used to a constant stream of tragedy that we fail to keep an attention span. How is it possible that America has become desensitized to the deaths of human beings? This could be at the fault of two matters: either the excessive stream of catastrophe America watches on the news or reads online has caused the American population to tune everything out (for the sake of their sanity); or, the fact that the news and social media neglects to advertise that 100 people in America are shot on a daily basis leaves America uneducated and careless. Another thing to recognize is that certain things hold more importance within the American people than others. For example: the death of a young black boy does not get nearly as much attention as the death of a celebrity figure. America quite literally asks itself: which life matters more? A great percentage of the time, a celebrity scandal gets more attention than the 100 people being shot everyday. 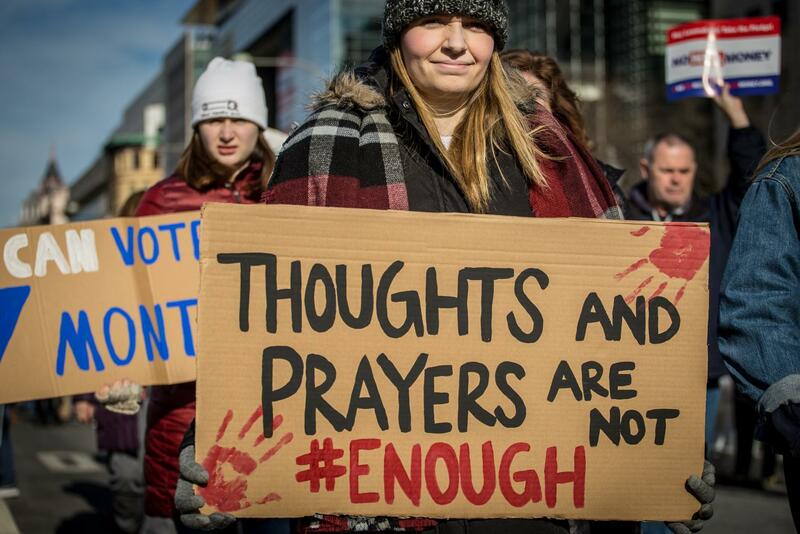 When it comes to such things as mass shootings and enormous tragedies, America gets credit where it’s due: it can be praised for the 48 hours it chooses to give away its thoughts and prayers. The original version of this article can be found in Affinity Magazine.